Over-seeding is the practice of spreading new seed over an established turf. Bermuda, zoysia, and other warm-season grasses go dormant and turn brown during the colder winter weather. 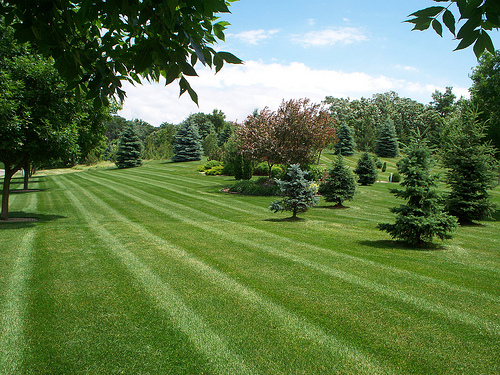 Over-seeding your lawn with a cool-season grass gives you a green lawn throughout the entire year. When over-seeding, you are actually seeding into the existing warm-season turf. Rye grasses are well suited for this purpose and more specifically perennial ryegrass is highly recommended. Over-seeding just before the warm-season grasses go dormant ensures that you’ll enjoy green grass throughout the winter months. Good fall establishment will require some seed bed preparation, but tilling should be minimal enough to let the warm-season grass recover well in the following spring. St. Augustine and zoysia grasses are not well suited for over-seeding. However, lawns featuring bermuda grass are easily over-seeded, producing a green landscape year-long. The best time to over-seed your lawn with cool-season grasses will occur between October 1st and November 15th. Over-seeding too early in the fall can result in thin, spotty establishment; the actively growing bermuda grass will out-compete the ryegrass. If planted too late, growth is slowed down by colder temperatures resulting in poor establishment. Ryegrass seed germination will decline after soil temperatures start to move below 63º F. You can stick a cooking thermometer into the ground to determine the temperature. Make holes with a screwdriver to take the temperature in multiple areas of your lawn. Verti-cut, power rake, and mow your bermuda grass as low as possible to remove or reduce thatch. If you can only mow, lower your mower blades as far as they will go. You essentially want to scalp the grass down as much as possible. This will guarantee good seed contact with the soil. Planting your ryegrass seed is done just like planting grass for a new lawn. Apply grass seed using a spreader or seeder. Apply only 1/2 of the seed in one direction, and then apply the other 1/2 of the seed in the other direction. This method insures an evenly covered seed bed. If over-seeding with annual ryegrass, plant 10 to 20 lbs of seed per 1,000 square feet. If using perennial ryegrass (recommended), plant 10 to 15 lbs of seed per 1,000 square feet. Over-eeding more than this may cause excessive competition among seedlings. Crowded seedlings will be more susceptible to diseases. After seeds are planted, they must stay moist to germinate properly. Covering the seeds with finely-ground bark mulch, manure compost, or sand which will help hold the moisture in; this practice is known as top-dressing. Do not use peat moss because it is difficult to keep wet and can blow away. Light, frequent watering (up to three times a day) is essential during the first seven to ten days. Keep the soil moist until the seedlings have established their roots. Germinating seeds need a lot of oxygen so don’t overwater and cause flooding. Water the newly-planted seed for about 15 minutes to get the grass seed and soil soaked well the first time. Continue watering three times daily for 3 to 7 minutes each for the first 7 to 10 days. If your soil drains well, you may water for longer but if your soil is heavy and doesn’t drain well, prevent puddling by shortening your watering time. Once germinated, grass seed watering intervals should gradually shift to about once each week. During the coldest times of the season, you may only need to water once every two weeks. Monitor the soil moisture by sticking a screwdriver into the soil. If the screw driver goes in easily and comes out damp, you don’t need to add water. You want to keep the top six inches of soil moist; when your grass needs water, it will let you know. Symptoms of moisture stress are wilting, grey-green color and footprint indents remaining visible long after stepping over lawn. Two weeks after seedlings emerge, apply a high-phosphorus grass fertilizer, which will promote good root development. There are many starter fertilizers that you can choose; one example is ammonium phosphate (16-20-0), which you would apply at about 5 pounds per 1,000 square feet. Annual and perennial ryegrass should be first mowed when they reach heights between 2 ¾-inches and 3 inches. If using a rotary mower, set the blade height between 2 ¼-inches and 2 ¾-inches. If using a reel-type mower, mow your lawn between 1 and 1 ½-inches, when grass is a third of the normal mowing height. Bermuda and most warm-season grasses start growing back when nighttime temperatures reach the upper 60s. To encourage the return of your bermuda grass, lower the mowing height to an inch or less once the nights become warmer. This will effectively scalp the cool-season grass, reducing shade and warming the bermuda grass beneath. At this point, stop fertilizing, but continue mowing low and maintaining good soil moisture for your grass. This will reduce competition between the bermuda and the ryegrass, helping your bermuda grass come back strong. Click here for more information about your home state!